An oft repeated saying about a well built aircraft is that it is several million parts flying in close formation. All of these parts are made using tight tolerances and high standards with a wide variety of materials and production methods depending upon their construction application on the aircraft. This module will introduce the characteristics and properties of many types of materials typically used in aircraft construction from small unpressurized recreational aircraft to the largest and most modern jet passenger aircraft. Typical metals used in aircraft include ferrous and non-ferrous metals such as aluminum, steel and titanium. In some of the latest aircraft models being produced, non-metallic composites comprise most of the primary and secondary aircraft structures. Wood structures and fabric coverings can also still be found on some older models. Rivets, bolts, studs, screws and other fasteners that join different parts of the structures and also holds various components to structural mounts are also introduced as well as identification and inspection methods for all items used in the construction of an aircraft. 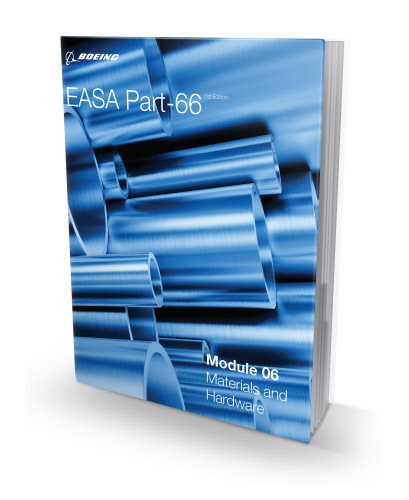 The learning content of this module also covers many of the typical components used in the installation and operation of systems installed in the aircraft such as springs, bearings, transmissions, plumbing systems, flight control cables, electrical cables and connectors.